The fall of Muammar Qaddafi‟s regime in 2011 has sparked an escalation of ethnic tensions in Libya‟s southern province of Fezzan, where indigenous Toubous1 have experienced recent violent clashes with local Arab tribes, particularly the Zwai. The towns of Sabha and Kufra remain under a tense ceasefire between the heavily-armed tribal militias, while upcoming national elections on July 7, 2012 threaten to trigger renewed fighting. Further escalation or diffusion of violence could destabilize Libya‟s fragile democratic transition and draw transnational actors into the conflict. To contain the outbreak of further violence and encourage the political inclusion of the Toubou into the new Libyan state, the Canadian Government should act in cooperation with UN allies to assist the Libyan transitional government restore a minimal capacity for security provision and policing within its territory, encourage dialogue to accommodate Toubou aspirations to equal citizenship and political participation, and promote exiting grassroots initiatives for inter-ethnic dialogue and cooperation. The substantive section of this report, which will examine characteristics, causes and consequence of the conflict, is based on original research from academic and news sources.2 In addition to the substantive analysis, the report provides policy options and considerations from a Canadian Foreign Policy perspective, which are aligned with the Department of Foreign Affairs Report on Plans and Priorities 2012-13, Strategic outcome 1, “Canada‟s International Agenda,” program activity 1.2 “Diplomacy and Advocacy.”3 Annex I presents best, worst, and most likely future scenarios forecasting. 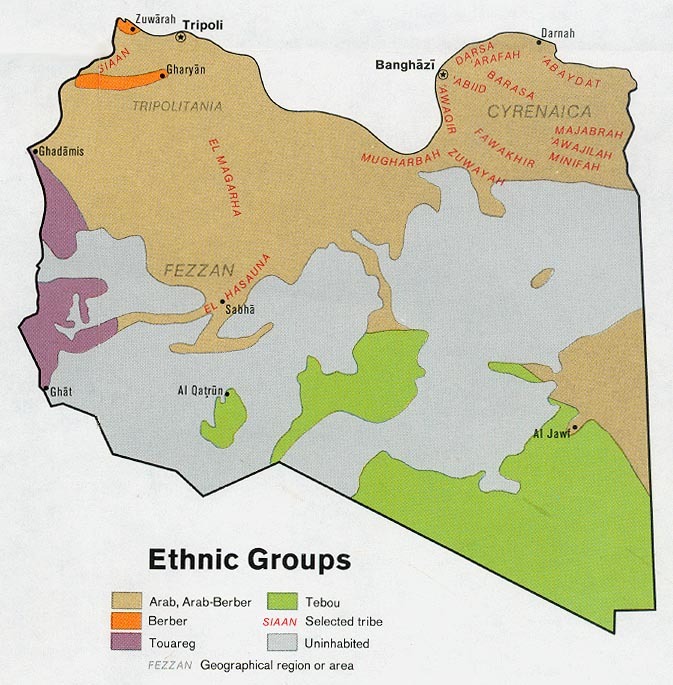 Annex II provides a brief fact sheet on the Libyan Toubou, and Annex III provides geographical context with political and demographic maps of the region. Against the backdrop of increasing ethnic tensions in Libya, the 130-person Higher National Election Commission, led by Chief Commissioner, Nuri Al-Abbar, has decided to postpone Libya‟s legislative elections from June 19 to July 7. Commissioner Al-Abbar explained that the lack of resources, as well as logistical and technical issues contributed to his decision. Potential candidates are still being vetted, and as such, election campaigns have not been launched. Despite the delays, 2.7 million voters, or 80 percent of eligible voters have registered.18 Security remains a foremost concern during the election process. Despite requests from the commission, no government security forces were present to monitor the integrity of the process or maintain security when voters were registering last May. For example, one registration centre at a school in Tripoli had to be shut down when “a group of militia turned up in pick-up trucks mounted with anti-aircraft guns to demand more representation for militia men.”19 In a country that has not had democratic elections since 1952, the security situation on July 7 will be strained. The conflict is caused in part by the deprivation of Libyan Toubou of social recognition and full inclusion in the wider political and economic system, consistent with “grievance” and identity-based theories of ethnic conflict.20 For decades, Qaddafi‟s regime pursued national policies of “Arabization” and sought to expel the Toubou, along with other minorities, from Arab Libya. The 1969 Constitutional Declaration defined the state of Libyan Arab Jamahiriya, as an “Arab nation and declared Arabic as the only official language.”21 Subsequent policies deliberately denied basic human and political rights to non-Arab minorities in Libya, including the 2007 withdrawal of citizenship rights.22 Underdevelopment and lack of infrastructure persist in the region, but the greater issue and catalyst for conflict is lack of access to full citizenship rights and public services. The collapse of the Libyan state following the 2011 revolution has also created favorable conditions for ethnic mobilization and violence, including the rapid expansion of self-defense tribal militias. “Opportunity” theories of ethnic conflict predict that a decline in state capacity and legitimacy, or other politically destabilizing events render insurgencies more feasible and attractive.25 Enabled by the collapse of state authority during the fall of Qaddafi‟s central regime in 2011, Toubou militias have mobilized to provide communal security and to consolidate control over key economic resources in the region, particularly illicit smuggling routes across Libya‟s southern borders.26 As the transitional regime‟s capacity and legitimacy remain weak in the South, state security forces are unable to ensure adequate public security and disarm the militias. Third, security dilemma theories predict that ethnic mobilization in the context of collapsed and ethnically intermixed states will create perceptions of vulnerability among other groups, initiating a spiral of conflict escalation.27 Mobilization of the Toubou has triggered fears among other ethnic groups – particularly the Zwai, who are the primary contenders for control of the smuggling routes – of potential Toubou predominance in the region. Fuelled by a surfeit of arms and a prior history of inter-ethnic hostilities, these conditions have set in motion an ethnic security dilemma between communities in intermixed areas such as Sabha. In the absence of a central authority to arbitrate between the parties, each ethnic group has taken to self-defense by way of armed militias, which in turn fuels hostilities and suspicions of adversaries‟ aggressive motives. The consequences of this security dilemma include ethnic un-mixing in urban areas such as Sabha, where the majority of the Toubou population have fled the city.28 Reports also indicate that militant Toubou youth from peripheral areas are relocating to Sabha and Kufra in order to “support fellow Toubou fighters,”29 suggesting the diffusion of the conflict outside of urban areas to larger sections of the population. These trends suggest a growing polarization of ethnic relations across southern Libya, contributing to a wider Arab/African identity cleavage in the region. The first priority of the Canadian Government should be to assist in the re-establishment of minimally capable security institutions for the Libyan state. A neutral military and police force with sufficient operational capability to regulate disputes between Toubou and Zwai militias would deter aggressive behaviour, mitigate the ethnic security dilemma, and decrease the ability of ethnic chauvinists to mobilize militias through appeals to communal self-defense. Canadian civilian experts can be deployed to provide training, capacity-building and advisory functions under the United Nations Support Mission in Libya (UNSMIL), which is mandated to restore public security and the rule of law. This deployment can be facilitated through the CPA (Canadian Police Arrangement) under the Global Peace and Security Fund of the Stabilization and Reconstruction Task Force (START). A secondary priority is to encourage the development of grassroots peacemaking initiatives, such as the recent „Committee of Wise Men for Negotiation,‟ which is a small group of local representatives and government officials convened by the transitional government to mediate tribal hostilities in Libya‟s peripheral regions.38 The removal of Qaddafi‟s regime opens space for such civil society organizations to foster communication and reciprocity between ethnic communities, an important mechanism for containing communal violence.39 Financial support and conflict-mediation training services could be provided under UNAMIL‟s civilian peacebuilding operations. 1 Also referred to as “Tibu,” “Tebu” and “Tubu.” Hereinafter referred to as Toubou. 2 Note to the reader: very few academic and journalistic sources exist on this conflict. As such, the report seeks to provide an analysis, while providing directions for further policy research on the conflict moving forward. 3 Refer to Foreign Affairs and International Trade Canada Report on Plans and Priorities 2012-13 at www.tbs-sct.gc.ca/rpp/2012-2013/inst/ext/ext-eng.pdf. 4 David Cutler, “Factbox: Who are the Tebu?” Reuters (April 8, 2012), www.reuters.com/article/2012/04/08/us-libya-violence-tibu-idUSBRE83704O20120408. The Toubou do not have enough representation to be considered in the minorities at risk database. 6 See, for example, Emanuel Marx, “The Political Economy of Middle Eastern and North African Pastoral Nomads,” in Nomadic Societies in the Middle East and North Africa: Entering the 21st Century, ed. Dawn Chatty (Brill: 2006), 78-97. 7 Wyre Davies, “Battles over Libya‟s dangerous migrant smuggling routes,” BBC News (23 March 2012), www.bbc.co.uk/news/world-africa-17481181. 9 UN Human Rights Council, “Summary prepared by the Office of the High Commissioner for Human Rights in accordance with paragraph 15 (c) of the annex to Human rights Council resolution 5/1. Libyan Arab Jamahiriya,” A/HRC/WG.6/9/LBY/3 at 7. 11 International Crisis Group, “Crisis Watch No. 105,” (14 December 2011), www.crisisgroup.org/en/regions/ middle-east-north-africa/north-africa/libya.aspx. 12 Florence Gaub, “Libya in Limbo: How to Fill the Security Vacuum,” Research Report, NATO Defense College (September 2011). 14 Reliefweb reported in February that fighting in Kufra involved light arms, rocket-propelled grenades and anti-aircraft guns. Agence France-Press, “New Clashes Rock Libyan desert town,” Reliefweb (15 February 2012), http://reliefweb.int/node/476734. 15 Agence France-Press, “More than 100 killed in south Libya clashes: tribes,” Refliefweb (21 February 2012), http://reliefweb.int/node/478161. 16 Agence France-Press, “More than 100 killed in south Libya clashes: tribes,” Refliefweb (21 February 2012), http://reliefweb.int/node/478161. 17 “Sudan, Chad and Libya establish joint patrols to control common border,” Sudan Tribune (9 March, 2012), http://www.sudantribune.com/Sudan-Chad-and-Libya-establish,41850. 18 Hadeel Al Shalchi and Ali Shuaib, “Bureaucracy clogs Libya‟s road to democracy,” Reuters (11 June, 2012), www.reuters.com/article/2012/06/11/us-libya-vote-preparations-idUSBRE85A12J20120611. 20 On identity/grievance theories, see Edward Azar, “Protracted International Conflicts: Ten Propositions,” in International Conflict Resolution, ed. Edward E. Azar and John W. Burton (Lynne Rienner, 1986); Ted Robert Gurr, “Peoples Against States: Ethnopolitical Conflict and the Changing World System,” International Studies Quarterly 38 (1994): 347-377. 21 UN Human Rights Council, “Summary prepared by the Office of the High Commissioner for Human Rights in accordance with paragraph 15 (c) of the annex to Human rights Council resolution 5/1. Libyan Arab Jamahiriya,” 7. 22 UN Human Rights Council, 7. 23 IRIN, “Analysis: Libyan minority rights at a crossroads,” IRIN News (24 May 2012) www.irinnews.org/Report/95524/Analysis-Libyan-minority-rights-at-a-crossroads. 24 Tracey Shelton, “Libya‟s „Committee of Wise Men for Negotiation‟,” Globalpost (May 19, 2012), www.globalpost.com/dispatch/news/regions/africa/120518/libya-tribes-tuareg-peace-unity-wise-men-negotiation. 25 On “opportunity” theories, see James Fearon and David Laitin, “Ethnicity, Insurgency, and Civil War,” American Political Science Review 97, no. 1 (2003): 75-90; Paul Collier and Anke Hoeffler, “Greed and Grievance in Civil War,” Oxford Economic Papers 56 (2004): 563-95. 27 Barry Posen, “The Security Dilemma and Ethnic Conflict,” Survival 35, no. 1 (1993): 27-47; Chaim Kauffman, “Possible and Impossible Solutions to Ethnic Civil Wars,” International Security 20, no. 4 (1996): 136-75. 30 David R. Davis and Will H. Moore, “Ethnicity Matters: Transnational Ethnic Alliances and Foreign Policy Behavior,” International Studies Quarterly 41 (1997): 171-184; Lars-Erik Cederman, Luc Girardin and Kristian Gleditsch, “Ethnonationalist triads: Assessing the influence of kin groups on civil wars,” World Politics 61, no. 3 (July 2009): 403-47. 31 On the importance of geographic settlement patterns for capability and legitimacy in separatist movements, see Monica Duffy Toft, “Indivisible Territory, Geographic Concentration, and Ethnic War,” Security Studies 12, no. 2 (2002/3): 89-90. 32 Cederman, Girardin and Gleditsch, “Ethnonationalist triads,” 404. Likewise, an irredentist bid for unification with a bordering state would be unlikely, since the Toubou constitute only small minorities in neighboring Chad, Niger, and Sudan. 33 The Country Indicators for Foreign Policy (CIFP) Country Ranking Table 2007, for instance, ranked Chad as 16th worldwide on its „Fragility Index‟. See CIFP Website, http://www4.carleton.ca/cifp/app/ffs_ranking.php. 34 See Erin Jenne, Ethnic Bargaining: The Paradox of Minority Empowerment (Ithaca: Cornell University Press, 2007), 10-11. 35 Fred Abrahams, a regional advisor with Human Rights Watch, similarly dismissed Toubou aspirations for a regional homeland: “At this point I think they are posturing. They are divided themselves and this is not a serious option.” Rebecca Murray, “Libya: Peace Lost in the Desert,” Inter Press Service (28 April 2012), http://allafrica.com/stories/201204290209.html. 36 Foreign Affairs, Report on Plans and Priorities 2012-13 at www.tbs-sct.gc.ca/rpp/2012-2013/inst/ext/ext-eng.pdf, 12-13. 37 Foreign Affairs Report on Plans and Priorities 2012-13 at www.tbs-sct.gc.ca/rpp/2012-2013/inst/ext/ext-eng.pdf, 14. 39 Ashtosh Varshney, Ethnic Conflict and Civic Life: Hindus and Muslims in India (Yale University Press, 2002). 41 See International Covenant on Civil and Political Rights, 23 March 1976, Can. T.S. 1976 No. 47, (1966), 999 UNTS. Peacekeeping forces from the NTC are successful in containing major outbreaks of further violence. The legislative elections in June are viewed as sufficiently legitimate and fair to continue political dialogue within the framework of the official transitional council. The TFSL agrees to demobilization and integration into a reformed Libyan military, along with fighters from the Zwai self-defense militias. Remedial policies are implemented by the new Libyan regime to enhance Toubout political participation and redress discriminatory citizenship requirements. Further escalation in violent clashes between militias in heavily populated urban centres, with potential diffusion to other ethnic groups in the region or across Libya‟s southern borders with involvement of Chadian or Sudanese Toubou fighters. Severe setbacks or a breakdown in the democratic transition in Tripoli impede the ability of the central state to provide effective conflict management, resulting in the growth of self-defense militias and loss of political influence among moderate ethnic leaders. Protracted violence conflict/insurgency impedes stability, political reform, or economic reconstruction. Maintenance of low-level clashes with a minor risk of conflict diffusion across borders. Toubou leaders continue to express grievances against pro-Arab discrimination and exclusion from the central political process, where attention will remain focused on security sector reform and national elections. Over time, the state is able to provide minimal policing services, while the Toubou are offered moderate political concessions in the form of devolution and autonomy.